Our StateBroadcastNews.com division is providing exclusive news content for GlobeSt.com, the leading website devoted to coverage of news in the commercial real estate markets nationally. 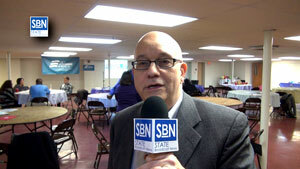 Correspondent Steve Lubetkin reports from an ACA workshop in Orange, NJ earlier this year. Steve is reporting for GlobeSt.com as New Jersey and Philadelphia editor, and SBN is working with GlobeSt.com to develop audio and video podcast resources and content for GlobeSt.com, which is owned by ALM, which also publishes Real Estate Forum, American Lawyer, and an array of other legal and business publications and websites. We are thrilled to be partnering with a news organization that has the reputation of GlobeSt.com. This news gathering and reporting relationship demonstrates what we’ve been talking about for years. It’s a proof-of-concept for the online evolution of journalism perfectly, where a seasoned journalist with audio and video production capabilities can partner successfully with a news organization to produce valuable news coverage for the readership of that news organization. It doesn’t matter if the content is delivered in textual, visual, or audio format, we need to be able to fill that need, and journalism sites that understand this, like GlobeSt.com, will prosper and grow. Commercial real estate market participants in NJ and Philadelphia can submit story ideas and information on their activities via email to steve@statebroadcastnews.com. LNJ 2009 #3 – Forum on the Future of New Jersey, Panel 2 – What should the lieutenant governor do in New Jersey?